Merchandise Mart is located at 222 West Merchandise Mart Plaza in Chicago and was completed in 1930. This building was designed by Graham, Anderson, Probst and White Architects and stands 340 feet tall with 25 floors. 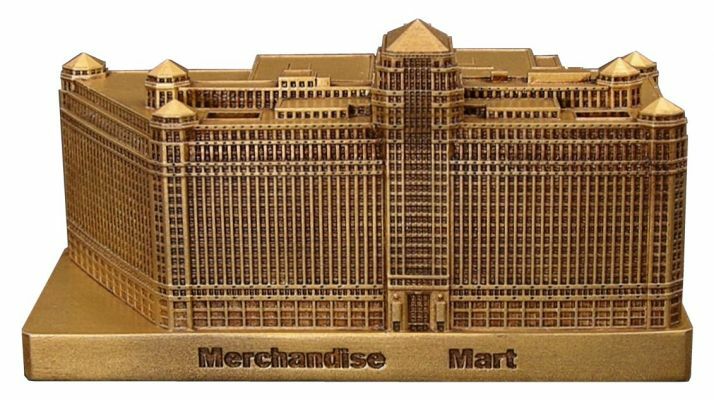 Merch Mart was once the largest building in the world with 4,000,000 square feet until the Pentagon surpassed it in 1943. Merchandise Mart is so massive that it has its own zip code! This pewter replica stands 5-1/4 inches wide and is finished in antique gold. This model's scale is 1 inch = 150 feet. I had no idea that this building had so much area to it. This is a wonderful addition to the riverfront architecture.